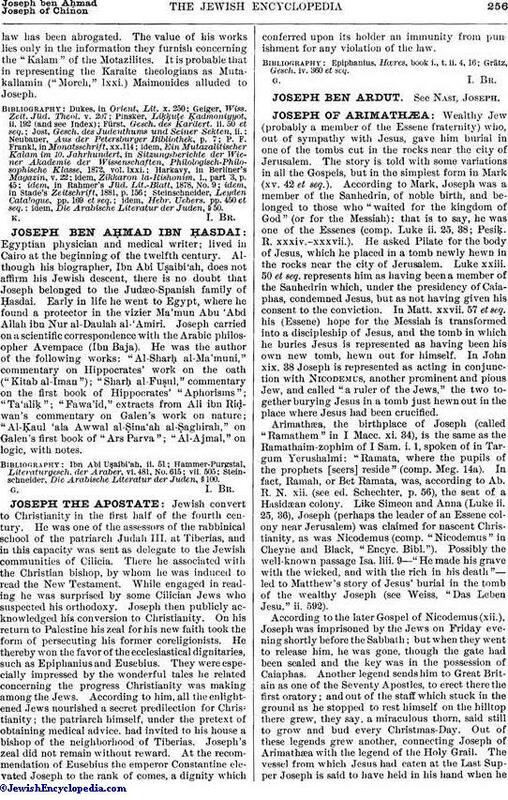 Jewish convert to Christianity in the first half of the fourth century. He was one of the assessors of the rabbinical school of the patriarch Judah III. at Tiberias, and in this capacity was sent as delegate to the Jewish communities of Cilicia. There he associated with the Christian bishop, by whom he was induced to read the New Testament. While engaged in reading he was surprised by some Cilician Jews who suspected his orthodoxy. Joseph then publicly acknowledged his conversion to Christianity. On his return to Palestine his zeal for his new faith took the form of persecuting his former coreligionists. He thereby won the favor of the ecclesiastical dignitaries, such as Epiphanius and Eusebius. They were especially impressed by the wonderful tales he related concerning the progress Christianity was making among the Jews. According to him, all the enlightened Jews nourished a secret predilection for Christianity; the patriarch himself, under the pretext of obtaining medical advice, had invited to his house a bishop of the neighborhood of Tiberias. Joseph's zeal did not remain without reward. At the recommendation of Eusebius the emperor Constantine elevated Joseph to the rank of comes, a dignity which conferred upon its holder an immunity from punishment for any violation of the law. Grätz, Gesch. iv. 360 et seq.